Set against the backdrop of Texas hill country in the 1970s, Ain't Them Bodies Saints is a brooding slow burn of a film that almost gets lost in the Terrance Malick/Robert Altman style it emulates. As such, the film feels mischaracterized as an outlaw movie or love story. It's a slice of Americana. Following the conventional plot lines of the outlaw couple, Bob Muldoon (Casey Affleck) wants to rob a bank with his buddy Freddy (Kentucker Audley) and make a clean break from the dusty rural town where they grew up. Muldoon's pregnant girlfriend, Ruth Guthrie (Rooney Mara), volunteers to drive for them. Writer-director David Lowery never provides any insight into the robbery itself, but centers on a shootout between the trio and county law enforcement, some of whom went to school with them. The standoff quickly ends when Freddy is killed and officer Patrick Wheeler (Ben Foster) is shot, establishing the foundation for the real story. 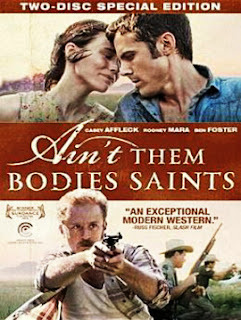 Ain't Them Bodies Saints is test of character and commitment. If there is a theme to the indie film that came out of the Sundance Institute's Writing and Producing Labs, it's the test of commitment of the bonds we make with other people with Ruth set at the film's center. Much of the movie weighs heavily on her splintered loyalties. Although it is Ruth who shot Wheeler, Muldoon frames himself as the shooter to protect her and their unborn daughter. His sacrifice works well enough. He is sentenced to a minimum of 25 years while she is left to raise their daughter Sylvie (Kennadie Smith/Jacklynn Smith) in a home given to her by grizzled and protective shopkeeper Skerritt (Keith Carradine). After several years, this becomes their new normal until Muldoon breaks out of prison. His escape sets Ruth on a collision course, forcing her to choose what is best between him, her daughter, the shopkeeper who remained a faithful father figure, or the officer she shot who had always harbored secret affections for her. As such, it feels less like a love story as much as a lost love story. Ruth may have waited for Muldoon, but his early escape forces her to confront her life. While he still feels the same way for her as the day he was sentenced, her life has moved on and her feelings seem much more grounded to his sacrifice than the love they once felt for each other. As law enforcement and bounty hunters track Muldoon, he places his trust in other old relationships too. Although any of them could be misplaced, he places his trust in long-time friend Altman (Artist Thornton) and Skerritt. While either man could be his undoing, it's Skerritt who tells Muldoon to give up on reuniting with Ruth and the daughter he never met. 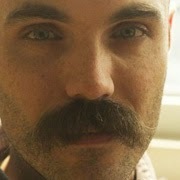 A few graphs about writer-director David Lowery's vision. There are three standouts in the film, with the first being the cast. Everyone delivers ovation-worthy performances. The second is the writing, with Lowery creating a script that is as poetic as it is plodding. The third is the cinematography, with its narrow focus on a few characters but ample attention paid to some sprawling and beautiful landscapes. This is how Lowery proves once again that he is an artistic storyteller to watch with his third and possibly finest film even if that doesn't make it perfect. Not everyone will appreciate the Terrance Malick stylings that make this too slow to be a thriller, too cold to be a love story, and too intellectual to make be a drama. Instead, it plays just like Lowery wanted it to, like an American murder ballad. The story is tragic even if it never gives you a clear hero or anti-hero to root for or an ending to hope for. Much like life sometimes, what constitutes a happy ending or a tragic one is obscure and blurred. And in this telling, it amounts to a focus on a narrow but emotionally distant film, with characters seemingly lost in their own uncertainty. Ain't Them Bodies Saints By Lowery Breaks 6.8 On The Liquid Hip Richter Scale. If you love films with deep, contemplative moods and beautifully shot textures, Ain't Them Bodies Saints will be appropriately mesmerizing and linger in your memory. But if you like your movies tight, spun around a distinct genre, or carriers of some cathartic message, it might be best to keep your expectations in check. Simply put, people who love films, especially nostalgic slices of life, will consider this a sleeper. Others will likely scratch their heads and wonder why it received such high ratings. And maybe that is why we like it so much. You can find Ain't Them Bodies Saints [Blu-ray] by David Lowery on Amazon. You can also order the DVD from Barnes & Noble or download the movie from iTunes.